Summary: Goon Squad is really more of a series of interconnected short stories than a traditional novel, which moves backwards and forwards through a span of about 60 years, following a number of characters who are loosely connected to each other. There's Bennie, the record producer, who we see from his punk teenage years in the 1970s all the way to the end of his career in the near (dystopian) future. There's his kleptomaniac assistant, Sasha, and a number of other characters who end up impacting each others' lives in a myriad of different ways. Alas, all fall prey to the same goon - time. Thoughts: What I most appreciate about this novel is that it proves that literary fiction can be "fun." That seems to be a dirty word in some intellectual circles, but I celebrate any novel that excels in making you want to continue to turn the pages. This is a book that is really enjoyable, in addition to being a fine work of art. And a fine work of art it certainly is. Egan's prose style isn't flashy but bears all the hallmarks of finely crafted workmanship that doesn't need bells and whistles to draw attention to itself. 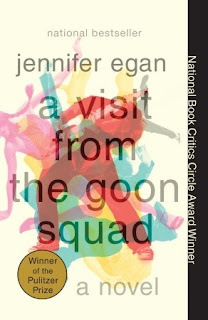 The simplicity downplays the sophistication of Egan's plotting, characterization, and settings, though she does have moments of flashier literary forms. Enter the highly controversial powerpoint chapter. A little girl authors a powerpoint presentation, which she uses to detail her family's difficulties in communicating, especially between her autistic brother and her father. It. is. brillant. Some people hate it, but to me, it was a roundly successful experiment in storytelling through an unusual medium. I also love that it seems to be a genuine step forward in the literary form itself. Thematically, Egan seems mostly concerned with the relationship that humanity and our environs have with time. How time changes our connections with other people, how time changes our technology, how time changes nature around us - all of these ideas are reflected in the stories. Egan also explore our relationship to music and how music affects our emotions. This isn't just a thinker though - there is plenty of plot to keep things cracking along and Egan injects quite of a bit of genuine, unforced humor. I highly recommend this as an entry book for folks who don't think they like literary fiction. Egan's novel exemplifies the intersection between pleasure and edification in fiction and I think that there is a little something in here for almost any reader. What was the last literary book that you read and both appreciated and enjoyed?